ICO or Initial Coin Offering have revolutionized the definition of startup funding by allowing people with an idea to raise the needed capital through the digital token sale. The existing method has paved the way for scams to take over the startup funding space and less credibility of the startups. To improve the current state of ICO market, DAICO has emerged and is dubbed to be the new and improved version of ICOs. 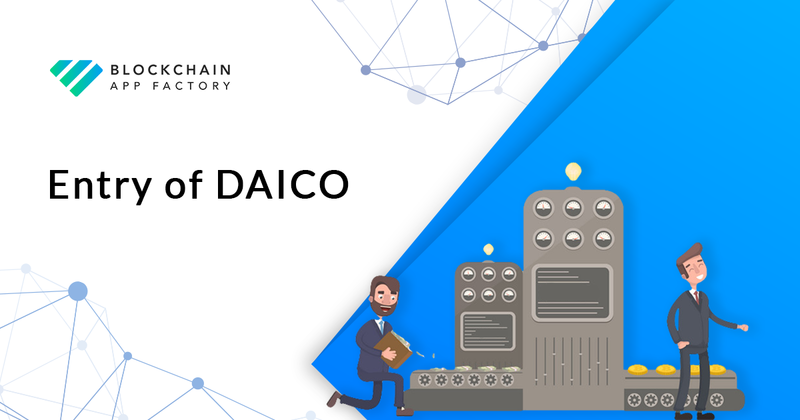 DAICO stands for Decentralized Autonomous Initial Coin Offering. It is a new fundraising concept that has coalesced the benefits of DAO (Decentralized Autonomous Organization, a digital organization that initiated the investor-directed venture capital fund) and ICO (Initial Coin Offering) to improve the state of digital token sales. This DIACO proposal was put forward by Vitalik Buterin, Founder of Ethereum, as he explained the usage of DIACO to the investors who contribute funds to a project. The investors can contribute funds to any blockchain project during a specific time period called “Contribution period.” Once the contribution period is over, investors can regain control of the funds they have voted upon, and the concerned developers can receive the said amount in the following months to come. DAICO allows startups to raise funds without the intervention of venture capital, angel investors or traditional banks, just like ICO, but the ability for the investors to vote with their token is new in digital crowdfunding. Investors can hold the developers accountable throughout the development stages of the project. This proposal has come through in light of increasing number of ICO scams, and DAICO creates a reliable platform for the investors to invest in blockchain projects without the market’s pervasive risks. The main disadvantage of DAICO is the risk of developers issuing a utility token instead of a securities token. It is still unclear on this issue, and this may create a problem with SEC and US regulatory laws in cryptocurrency market. This would mean a breach of trust, towards converting tokens, including utility tokens that have to be registered and compliant with securities laws. Abyss, a Malta-based gaming platform has implemented DAICO from April to May 2018 has raised over $15 million from various investors. They aim to develop a platform that provides gamers to monetize their gaming skills and pays the participants in tokens to refer new players on the platform. As per Abyss’s DAICO smart contract, the project developers will be able to take half of the soft cap funds so the developers will receive 500 ETH per month. Also, the smart contract is equipped with self-destruction mechanism so that if investors are discontented with the project’s progress, they may choose to revoke the remaining funds. This sole project’s raking of capital investment through DAICO is a testament to DAICO’s success. With the initial success of DAICO, there is a high chance that DAICO will adopt a new and secured law compliant token to attract investors to its side. DAICO assures transparency and control over the investors’ fund. DAICO has the potential to change the face of ICO investing in the market.